A map depicting the northwest region of Croatia with inscriptions and dates that detail the most important battles against the Ottoman Turks in the 15th, 16th and 17th centuries. There is a letterpress dedication to Martin Borković, Bishop of Zagreb from 1647 until 1667, and to Count Nikola Erdödy. A signature on the bottom right in a cartouche reads “per R.P. STEPHANVM GLAVACH” and “NOVA hactenus ... SCLAVONIAE et CROATIAE ... Confiniumque Descriptio ... Professorem 1673”. 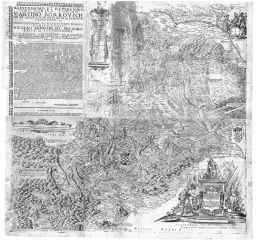 The map is an announcement of the Croatian Counter-Reformation and the beginning of the Baroque style. Made by the Jesuit, Stjepan Glavač the first teacher of logic at Zagreb Jesuit Academy and professor of philosophy, exegesis and controversy at Graz University, its production was the incentive of the Bishop of Zagreb Martin Borković, and the Croatian ban (viceroy) Nikola Erdödy. The map shows the “remnants of the remnants” of the former Kingdom of Croatia after Ottoman expansion ended. Drawings, made by Glavač while he travelled throughout Croatia accompanied by soldiers and Krajina officers as consultants, decorate the map. The map presents a rare example of decoration in the spirit of the Society of Jesus, shown particularly in the drawings of Mars in armour and the female figures of Fidelitate constanti and Catholica Fide. A geographical-historical map of northwest Croatia in 1673, it was drawn by the Jesuit Stjepan Glavač, a teacher at the Zagreb Jesuit Academy and at Graz University. Glavač spent several years travelling through dangerous and inaccessible regions of Croatia accompanied by soldiers and Krajina officers who acted as consultants. The map, showing the “remnants of the remnants” of the former Kingdom of Croatia, and decorated solely with Glavač's drawings, is a rare example of decoration in the spirit of the Society of Jesus. Purchased in 1690 from Johann Weichard Valvasor by the Archdiocese of Zagreb Baron J. W. Valvasor, a Slovenian polymath and collector, had a museum in his mansion in Bogenšperg. Towards the end of his life, due to financial difficulties, he sold some of his exceptionally valuable holdings. In 1690, the Bishop of Zagreb, Aleksandar Mikulić, purchased Valvasor’s collection of prints and his library. Marković, M., Descriptio Croatiae. Hrvatske zemlje na geografskim kartama od najstarijih vremena do pojave prvih topografskih karata (Croatian lands on Geographical Maps from the Oldest Times to the Appearance of the First Topographical Maps), Zagreb, 1993.